Halifax is not a large city – according to Wikipedia it’s rated 14th in population size in Canada – about 300,000 - just a little smaller than Victoria on the opposite coast. Both cities boast small downtowns with few buildings over 10 stories. Both were important British naval ports and their layouts are similar. 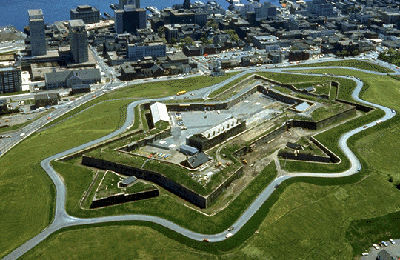 Our hotel is right across the street from the Citadel – a must see sight in Halifax – we wander over right after breakfast. 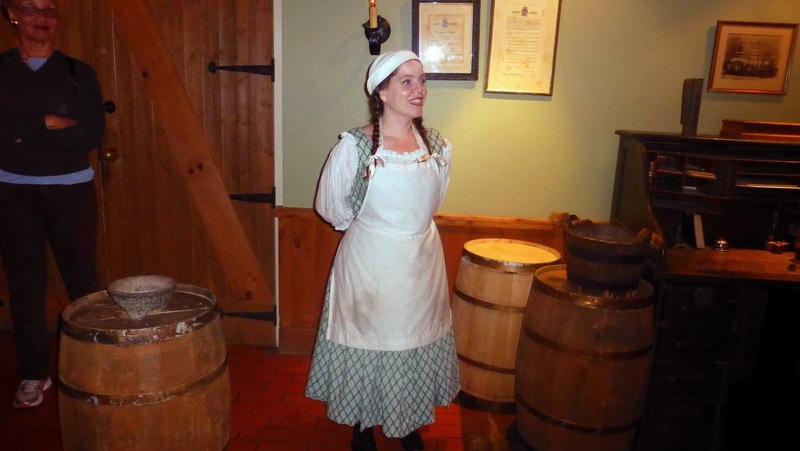 As with many of the attractions (as we discover around the trip), the events at the fort are in the “shoulder season” which means that things have been scaled back. The reconstruction of the fort is impressive as are the tours led by docents in period costumes answering questions. 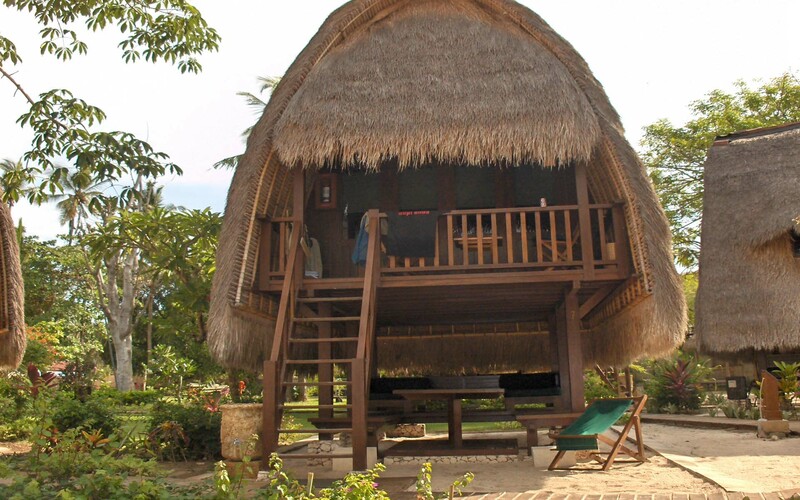 Plan to spend a couple of hours there. 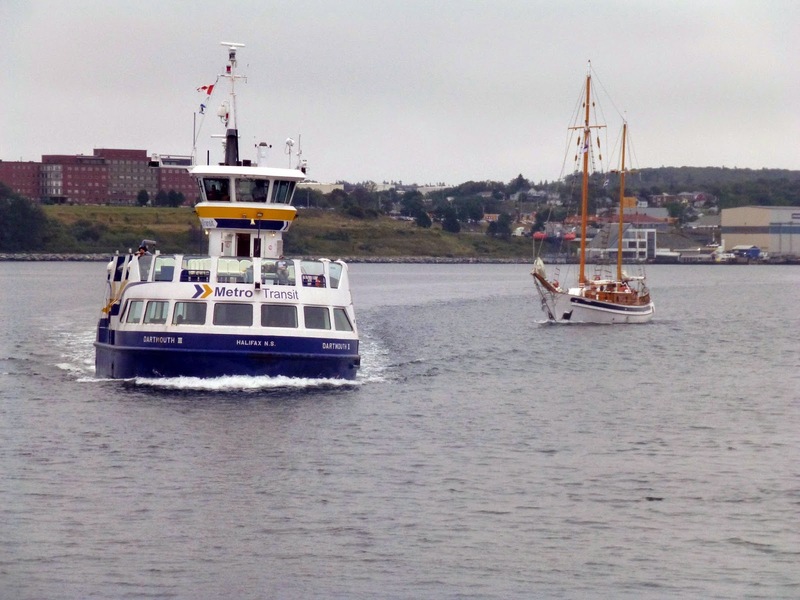 We do the usual – take a harbour ferry, check out StPaul’s Church, the oldest building in Halifax – still sporting shrapnel from the 1917harbour explosion and meander along the harbour esplanade. We have been warned that in Halifax the pedestrian is King. Cars must give way to pedestrians or face a healthy fine. It’s a novel experience to see that as soon as we approach an intersection cars and trucks immediately screech to a halt. It’s also scary to watch pedestrians blindly crossing streets without even looking sideways – absolutely certain that the cars will stop for them. I feel sorry for these people: they wouldn’t last two minutes in Vancouver or two seconds in Montreal. The following day we climb into our rental car and head out into the wilds of Nova Scotia. For someone from British Columbia where a short jaunt would be two or three hours I am surprised how close everything is – usually only 30 or 40 minutes. We’ve heard a lot about the “lighthouse route” so we chose to take the scenic ocean route rather than the “freeway.” We thought we’d see oodles of colourful lighthouses. What we didn’t realize was that the “lighthouse route” doesn’t actually run along the ocean – but is often a half a mile or more from the shoreline. If you want to see any lighthouses you have to turn off the road and head down to the ocean. Often these “scenic routes” aren’t marked and signs are scarce – even on the highways. This is in stark contrast to the highways in the rest of Canada where there’s a sign telling you “something” every 50 meters. I guess Maritimers believe if they tell you once that’s sufficient - or you should be smart enough to know where you’re going. For the most part we rely on Google Maps. I brought my dashboard mount for my cellphone and we have, for the most part, a reliable guide. The friendly guy at Budget Rent-a-car was willing to rent me a gps unit for only $15.00 a day. For the cost of a two week rental I could have bought a deluxe GPS unit. Don’t fall for that: use your phone. One of the “must see” destinations on our list is the Bay of Fundy. I’ve heard about the unbelievable tides and wanted to see them for myself. I’d experienced incredible tides on HaidaGwaii (The Queen Charlotte Islands) a few years ago on the longest day of the year. 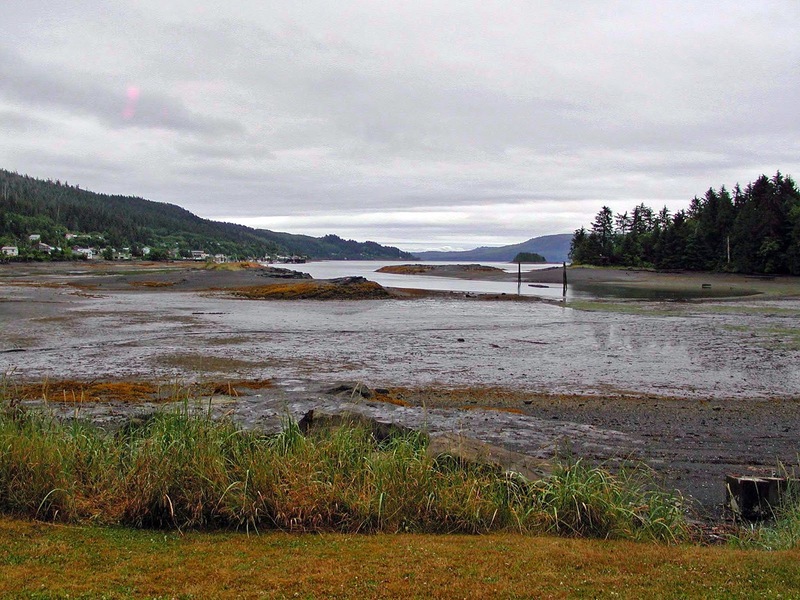 Queen Charlotte City: Tide out! morning – just as the tide was falling. We carried the first kayak down to the water and returned to the truck to get the next one. When we arrived back at the water the first kayak was high and dry and the water had retreated about twenty feet. We moved both kayaks back to the water’s edge and leave to get the next kayak. By the time all four kayaks are down to where the water’s edge was previously the water in the harbour was completely gone – leaving only a mud flat. We were forced to reload the kayaks and drive around the island to find a suitable deep water launching site. I am told the tides in the Bay of Fundy are even more impressive. Our destination is Alma - a small town in New Brunswick. We have the option of driving or taking the car ferry. 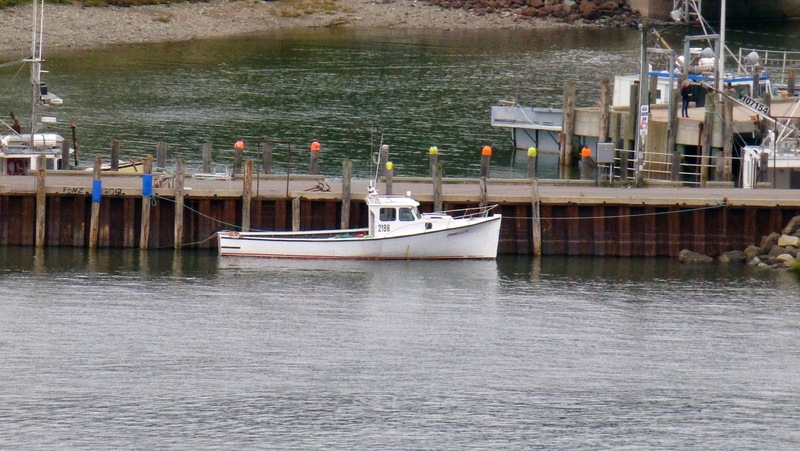 We opt for the car ferry from Digby to St. John – a choice I would not recommend. The car ferry is an ancient relic that must have seen service as a cod transporter, because the car decks absolutely reek of rotting fish. place to experience the most extreme tides. Like most of the other areas we traveled to the town is basically closed for the season. Most of the restaurants and tourist attractions close after Labour Day leaving only a couple of restaurants, a motel and a gas station open to service the local residents. We pull over at the public wharf on the edge of town. 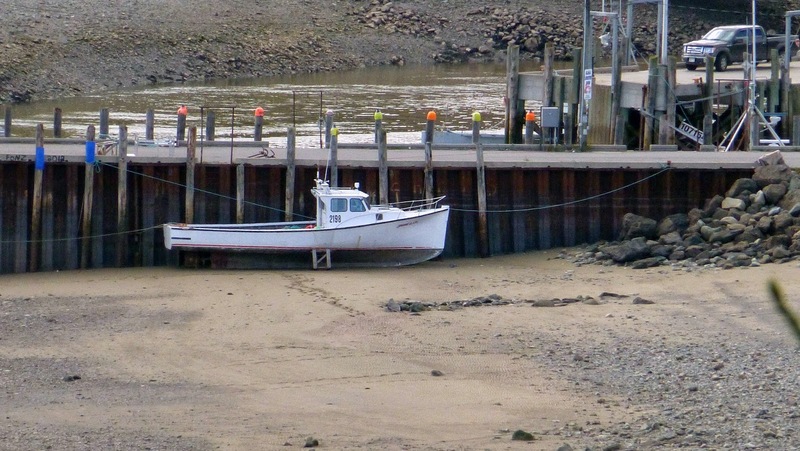 Several large fishing boats were resting on the mud twenty feet below the wharf. We continue on to check into our lodgings then head back to town to check out dinner possibilities. When we pass the wharf we visited only a few hours earlier, the fishing boats are all afloat and just about up to the wharf level. This in the space of only a few hours. As I mentioned earlier Google Maps was fairly reliable with one notable exception. 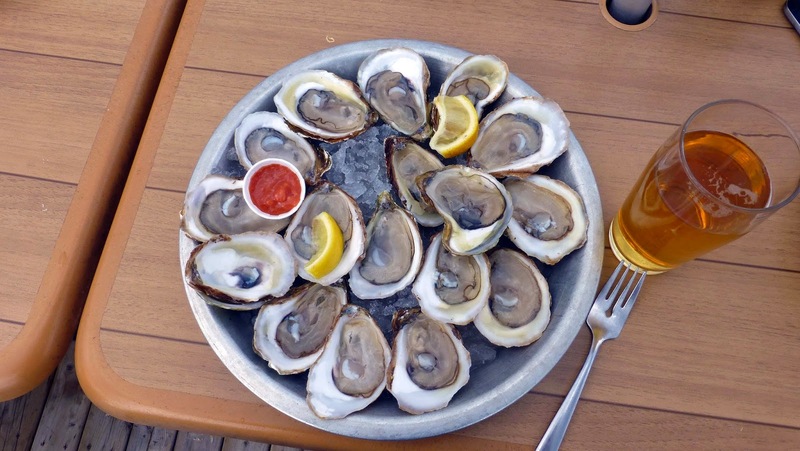 I’d heard a lot about Malpeque Oysters. They are supposed to be among the best oysters in the world. 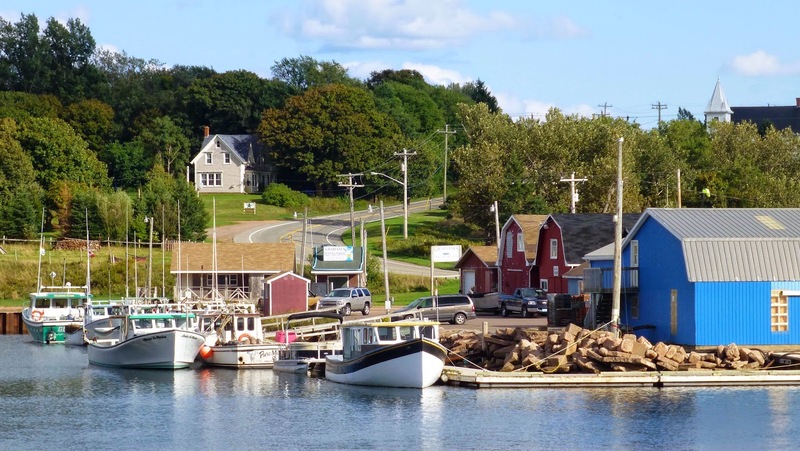 A visit to Malpeque Bay on Prince Edward Island was one of the first “must sees” I put on our “to do” list. 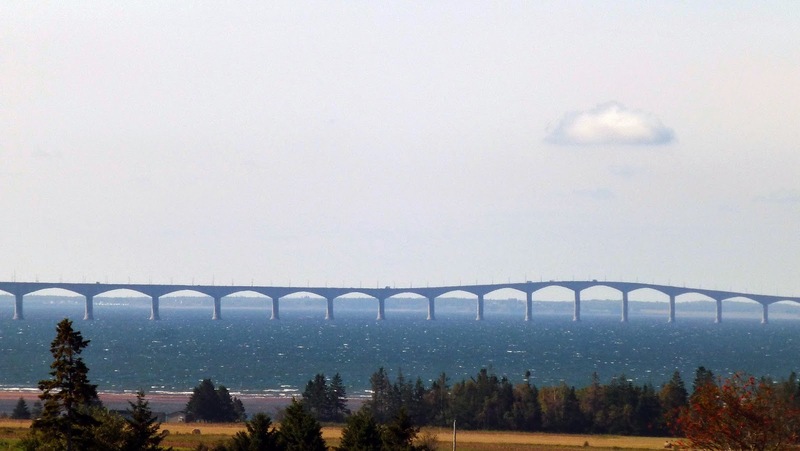 Of course this means a visit to Prince Edward Island and a trip across the much vaunted Confederation Bridge. If you’re not interested in Anne of Green Gables or Charlottetown you can probably see all of PEI in a day. Checking the guide books I find that “the” place to have Malpeque oysters is the “Oyster Barn” right on the water. I program the address into my GPS and we head off. 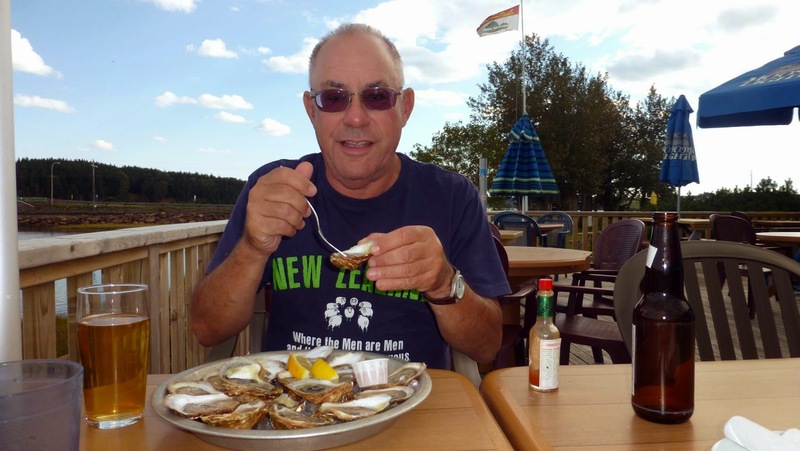 It’s about a 40 minute drive from Summerside and I am encouraged by the numerous signs along the way proclaiming the culinary excellence of the Oyster Barn. As we arrive in Mapeque Bay the Google Map Lady (GML) announces our destination is just ahead on the right. The only building in sight is a shuttered barn-like structure. The faded sign proclaims it to be the “Oyster Barn.” It appears to have been closed for some time. We look around for another eating establishment but can’t find any. In fact we don’t see a single soul. It appears like with many other attractions we have arrived too late. I consult Google again and am surprised to find in one of the many listings for the Oyster barn there is another address. I assume perhaps we have arrived at an older establishment or perhaps they have another restaurant in a nearby town. The only thing I can see is a guy pressure washing his driveway. He looks up as well pulled to a stop. “I’ve come for the Oysters,” I inform him. “What?” was the puzzled reply. “That can’t be. The Google Lady says it is, and at that moment she confirmed it. I hold out my phone. After a short conversation the gentleman tells me that he knows of a fish store a bit down the road that might have some Oysters. I get the name of the place from him, look up the address in Google, program it into the GPS and off we go for round three. After retracing our steps, GML puts us on a paved road and twenty minutes later we arrive at the fish store. There is only a bike in the parking lot, but it appears to be open, so I am encouraged. I enter and find the store manager loading the last of a tray of Oysters into the bike owners saddlebags. I explain to the store owner that I have come all the way from British Columbia for Malpeque Oysters and am am sadly disappointed I can’t find them. Well, in for a dime in for a dollar. We’ve come all this way and the day is half over. Why not? I program the bar’s address into Google and off we go again. About half an hour later we pull into the tiny town of Stanley Bridge and find Carr's Oyster Bar. I’m not encouraged – there are no cars in the parking lot. We park and walk up to the door and are pleasantly surprised to find it open. Once inside I am confronted with a huge table filled with ice and oysters. The waitress observes me staring at them. “You’re joking, right?” she replies. After a brief discussion on the merits of the different sizes a compromise is reached. I will take twenty of the small ones. Michele and I retreat to the outdoor deck overlooking the bay and wait for the waitress to shuck the oysters. A few minutes later my oysters and a cold beer arrive. It had taken the better part of a day and I don’t know how many hundred kilometers to get these oyster and I am suddenly worried that it might not have been worth it. Was it worth traveling 6000 km? You bet!! My concern proves unnecessary. They are definitely the finest oysters I’ve ever eaten. 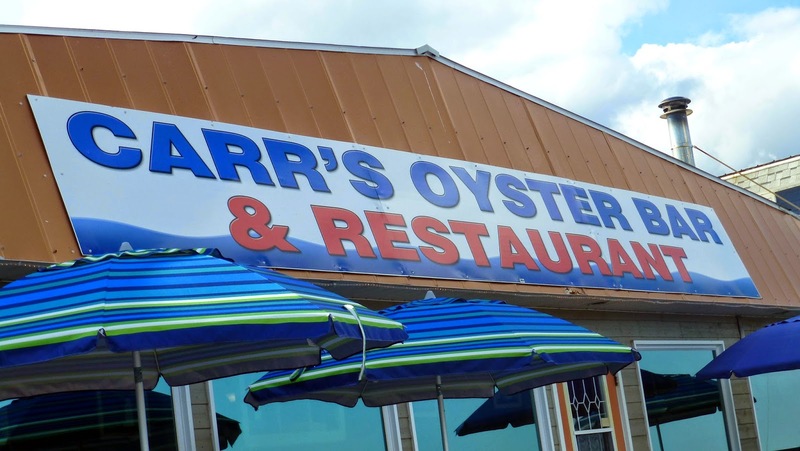 If you like oysters, you should definitely give Carr’s Oyster Bar in Stanley Bridge a visit.